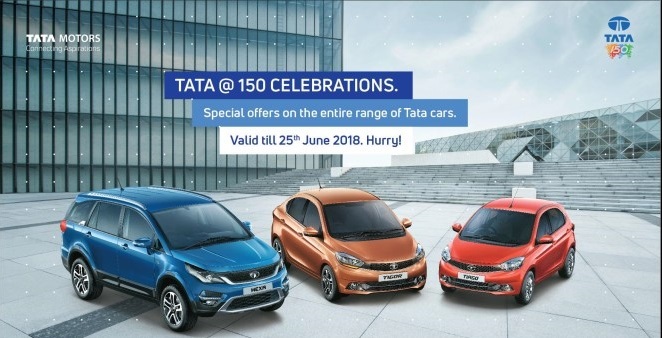 Celebrating 150 years of the Tata Group, Tata Motors has announced special offers for their range of cars here in India. This is a limited period offer and is valid till the 25th of June 2018. These special offers are valid across all Tata Motors dealerships in the country. Tata Motors has revealed that customers can avail up to INR 1 lakh worth of benefits, insurance provision at INR 1, special exchange bonus and other deals on accessories and other such products. Tata Motors is trying to boost sales this monsoon season with these offers. Tata Motors is currently riding high on the success of the Tiago, Tigor, Nexon & Hexa. All of these products have been very well accepted by the masses, and Tata Motors is back on the growth track. The passenger vehicle business showed a growth of 22% in FY18, which is a good sign for the business.